Because of the partial government shutdown, Wall Street’s “cop on the block,” namely the Securities and Exchange Commission, is “unable to carry out most enforcement against bad actors,” the new chairwoman of the House Financial Services Committee warned on Wednesday. “Businesses planning to enter the stock market through an initial public offering may be delayed because the SEC cannot approve their documents, harming American entrepreneurs and job creation,” Rep. Maxine Waters, D-Calif., told an audience at the liberal-leaning Center for American Progress Action Fund. 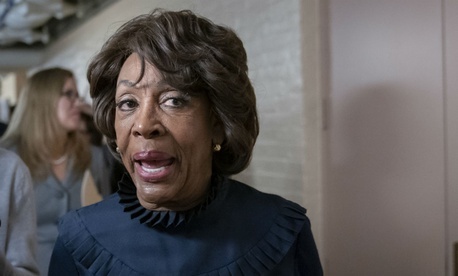 Waters also sketched out her oversight agenda, which will include “reversing” the dramatic deregulatory changes made by the Trump administration at the Consumer Financial Protection Bureau as well as steps to encourage more diversity among executives in corporate America. The SEC’s website since Dec. 27 has contained an announcement saying it is operating according to its shutdown plan “with a limited number of staff members available.” That plan for the agency’s 4,436 employees allows only 110 to work for law enforcement purposes, and 175 deemed needed to protect life or property. Enforcement actions, however, are not suspended. On Tuesday, the SEC announced in a release that it had filed “charges against nine defendants for participating in a previously disclosed scheme to hack into the SEC’s EDGAR [document filing] system and extract nonpublic information to use for illegal trading. The SEC charged a Ukrainian hacker; six individual traders in California, Ukraine and Russia; and two entities” that in 2016 had generated least $4.1 million in illegal profits. The agency is “staff-dependent, so whether it can approve certain things depends on whether staff are there,” added Charles Elson, the chair in corporate governance and the director of the John L. Weinberg Center for Corporate Governance at the University of Delaware. He personally heard that an SEC commissioner had to cancel plans to attend a presentation at the Association of American Law schools due to the shutdown. Aside from reopening federal agencies, Waters’ agenda for the new Congress will also focus on “ensuring we have a strong Consumer Financial Protection Bureau” in spite of Mick Mulvaney’s year-long tenure as acting director during which, in Waters’ view, he sought to “dismantle” the agency. Waters said she will reintroduce her Consumers First Act to restore CFPB's enforcement and supervisory powers and increase transparency and accountability. She said she also will “be keeping a watchful eye on all financial regulations” to make sure regulators are “doing their job” so that the post-financial-crisis reforms to protect consumers included in the 2010 Dodd-Frank Financial Reform Act remain. “One emerging area is the growth of financial technology firms,” she added, and “it is important that we encourage financial innovation.” Congress’s unresolved efforts to reform the Government Sponsored Enterprises Fannie Mae and Freddie Mac—under government conservatorship since the financial crisis—will also get her attention. Finally, the “low representation of minorities and women in the financial services industry,” particularly at the executive level, “needs to change,” Waters said. The SEC’s Office of Minority and Women Inclusion set up under the 2011 law “was a step in the right direction,” she said. “But laws that promote equality are only as strong as the implementation and enforcement of those laws.” To beef up congressional oversight, she is creating the first-ever Subcommittee on Diversity and Inclusion on the Financial Services panel.